What a great concert we had in February, just the thing to banish those winter blues and raise our spirits. Ben Sures (www.bensures.com) started things off and broke the ice with a great first set. I particularly liked the song he wrote about his father sending him home on the bus with a package of soggy tomato sandwiches; love comes in all forms, I guess. The Slocan Ramblers (www.slocanramblers.com) were every bit as fantastic as we knew they would be, in last month’s newletter Steve Pritchard said “they have the ability to drive bluegrass and old-time music direct to your heart … (they) play and sing hard, clean, emotional and with heart” and he wasn’t wrong. Too bad he couldn’t be there to enjoy it! We were pleased to find out that the Slocan Ramblers were nominated for a Juno....alas, they did not win in the Traditional Roots category but congratulations to fine musicians Pharis and Jason Romero, on the Borealis Record label (www.pharisandjason.com). And speaking of Steve, last month I said his radio show, Radio Boogie aired on CIUT.89.5fm from 3-6pm, so thanks to Sharon for e-mailing to remind me that the show has been running from 4-6 for quite some time now. I’m not sure what’s on at 3pm but if you tuned in early on my advice I hope you enjoyed it. CIUT.89.5fm is now the ONLY community radio station in Toronto. It has been a strong supporter of independent musicians and it's spoken word programming gives a voice to many under-represented communities. For some time now it’s been the only radio station that will help promote our Acoustic Harvest concert series (ask Lillian about this) and now CIUT.89.5fm is under threat. Ken Stowar, Station Manager and Programme Director writes “The Ontario Government has announced the introduction of the “Student Choice Initiative”. This will affect student levies that support campus services and organizations that have not been designated as “essential” as outlined in the new policy. As it stands right now campus media (radio, newspapers) have not been categorized as such.” Please go to www.ciut.fm to read Ken’s urgent message and how you can help. Another audience member (sorry I can’t remember your name, I’m sometimes a bit quick on the delete button- * Lillian's insert: her name is Adair Heath*) asked if we would be having The Laws (www.thelawsmusic.com) bacl again. Lillian responds that nothing’s scheduled at this time (so probably not next year) but she loves John and Michelle and would love to have them back in the future. The Laws have been busy these last few years with the Kingsville Folk Festival (www.kingsvillefolkfest.org). I haven’t been but Lillian tells me it’s a wonderful festival in a beautiful location. 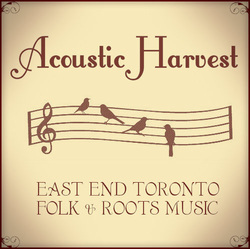 By the way, when John and Michelle decided to start a folk festival Lillian was one of the first people they asked to join their board and give them advice on booking artists, no doubt based on the fine job she’s done for Acoustic Harvest. And, always thinking ahead, Lillian was at FAI (Folk Alliance International) in Montreal last month, to read her report go to the News section on our website www.acousticharvest.ca. How do pieces of trees create a box that can stir emotion? Why does the grain of a soundboard always go in a certain direction? Why do guitarmakers use so many politically incorrect materials? Why is a Soundhole a misnomer? Suzie's career has seen triumph after triumph. Among her most recent successes: being nominated for a 2018 Canadian Folk Music Award for Producer of the Year with her co-producer, Mark Lalama. Suzie achieved finalist status in the Solo/Duo Category at the 2013 International Blues Challenge in Memphis, TN, received the 2012 CBC Saturday Night Blues Great Canadian Blues Award and the 2012 Sirius XM Canada Blues Artist of the Year. Suzie has won 10 Maple Blues Awards (she has been nominated for 22 so far! ), won the 2011 Canadian Folk Music Award for Contemporary Vocalist of the Year and is a 3X Juno Nominee. Rick’s storied career has seen him working in stellar collaboration and as a successful solo act. On his website it says “Rick believes in the transformative power of music” and so do we, so come on out to two amazing evenings of music and leave feeling refreshed and renewed; that’s what happens at all our concerts! Our first concert at St. Paul’s United Church was a big success, we had a great crowd and an atmosphere that was both warm and energized. The Sanctuary was made cheerier by the beautiful quilts that have been lent to us by The Woods Music and Dance Camp and by Pat Armour and they certainly add a homey touch. I think there are some stories attached to the quilts but you’ll have to ask Lillian about that as she was a regular at the camp and I’m sure she knows their history. Our guests, Garnet Rogers and Archie Fisher, were in fine form on what was one of the last stops on their last tour together. There were a few musicians in the audience for this special concert, including David Woodhead who toured a lot with Garnet when they played with Stan. I was thrilled to hear Garnet read an excerpt from his book “Night Drive – Travels with my Brother” (www.garnetrogers.com); it's funny when I read it myself but not nearly as hilarious as when Garnet reads it. This was also our Annual Healing Gardens concert and we were really pleased to meet Dr. Carol Redstone, the Head of The Critical Care Unit at The Mackenzie Health Foundation. Her speech was eloquent and from the heart as she told us that public monies only go so far and can only be spent on certain things and without efforts like ours there would be no funding for something as uplifting as a Healing Garden. Dr. Carol really enjoyed the evening and I think she’ll be coming back to Acoustic Harvest. It turns out that she’s a musician herself and worked her way through university by playing accordion – in a polka band, I think. For this one concert, for the first time ever, we did a 50/50 draw, and it was quite a lot of fun for Judy, Sytske and me to sell armlengths of tickets to the audience. We raised an additional $178.00 for The Healing Garden and one lucky audience member went home with the same – someone told me Garnet’s cousin won but later graciously donated his share to MacKenzie Health. Obviously, no first event in a new space goes off without a hitch and our first concert at SPUC was no exception. “Helen’s 50th Birthday Party” was taking place in the lower hall and that meant we were a bit squished for space for our refreshments and parking. Thanks to Helen and her birthday celebrants for accommodating us by keeping the sound of their party down as much as possible during our concert, and thanks to Reverend Dan who made a great effort to make sure everybody was happy; it couldn’t have been easy. For the rest of the season we’ll have access to the lower hall for refreshments and the parking won’t be an issue. Lynn Miles is one of Canada’s most accomplished singer-songwriters. With twelve albums to her credit, Lynn is the winner of multiple Canadian Folk Music awards (2011 English Songwriter of the Year), a 2003 Juno award for Roots and Traditional Solo Album of the Year and Love Sweet Love earned her multiple Canadian Folk Music awards (best English Songwriter, best Contemporary Singer). She has certainly found her strength over time. Keith Glass is a singer/songwriter, multi-instrumentalist (guitar, mandolin, bass), producer and a founding member, guitarist, and songwriter with Prairie Oyster, a group which has received critical acclaim, including multiple Juno and CCMA awards. Prairie Oyster is often cited as the country’s foremost roots/country band. They toured extensively in Canada, the U.S. and Europe over a career that spanned almost four decades. In 2008, Prairie Oyster was inducted into the Canadian Country Music Hall of Fame. Keith and his band mates are also the recipients of a SOCAN lifetime achievement award. We don’t often have an opening act but for this concert we’ll have the pleasure of hearing Piper Hayes. I heard her at Winterfolk(www.winterfolk.com) in February and became an instant fan. Steve Pritchard has been a strong supporter of Acoustic Harvest and has featured many of our guests on his show Radio Boogie, 4-6pm on CIUT, 89.5fm(www.ciut.fm). On November 14th Steve will be featuring Lynn Miles and it’s also going to be his fundraising show. As you may recall, CIUT.fm is an independent radio station and is run mainly by volunteers (the last time I checked I think they had 2.5 paid staff) and depends on donations from listeners and I’m sure Steve would appreciate your support. Acoustic Harvest will be making a donation to let Steve know we value his support and all the hard work he does to promote acoustic music. Thanks Steve. By the way, I’m sure you all know Topaz, she’s been running the merchandise table at Acoustic Harvest for many years now. Topaz also volunteers at CIUT and handles the phone lines for Reggae Riddims on Saturday from 10-midnight. This week, November 7th, Steve will be playing tracks from Tony Quarrington’s new CD “For King and Country” (www.tonyquarringtonsongs.com). Tony has been on the Acoustic Harvest stage many times, he’s everyone’s favourite guitar player, but on Sunday, November 11th, he’ll be presenting his show “For King and Country” at Hugh’s Room. This is a multi-media production about Canadians in WW1 and it’s a tour de force, a really amazing piece of work and I totally agree with Howard Gladstone (www.howardgladstone.com) that this should have a long run at a theatre. Congratulations to Jory Nash (www.jorynash.com) who was at Acoustic Harvest about a year ago. Jory has been appointed as one of a four person team to book talent for Hugh’s Room. He'll be focusing on singer-songwriters and would like to hear from you about who you’d like to see, so call him. I’m sure Jory will excel at this job, he’s always been very clear-sighted about the business of being an independent musician and, as presenter of 15 Tribute to Gordon Lightfoot shows, has proven to be a good organizer. Back to the business of Acoustic Harvest, booking starts early and is ongoing and we’re grateful to Lillian for taking on this task. We’d also like to hear who you’d like to see so please send Lillian an email Lillian.Wauthier@gmail.com. That’s it for this month, see you on November 17th.